A great sail, with a wonderful couple. 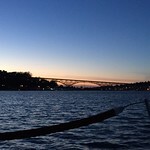 Hope to see you back on the water soon! 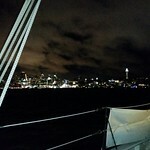 We had a lovely Valentine’s Day Charter tonight. The couple really enjoyed themselves. 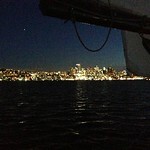 The skies were clear, there was wind on the water, and the stars were out. 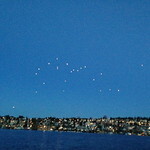 There were lanterns being released from Gas Works Park. It was truly gorgeous. 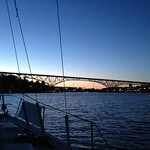 A beautiful evening sail, with a fun family. The ages ranged from 18 months to teenager. They unsure of the boat to start, but we suited them up in boat jackets (PFD’s) and headed out. It was a bit too windy for us to sail at night, but we enjoyed motoring around the lake seeing all the floating homes with lights and quite a few boats on the water lit up with lights. 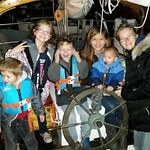 By the end of the sail, all the kids wanted to keep going. 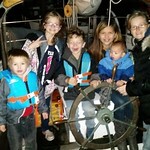 Most of the kids took a turn driving the boat, and did quite well. We also might have a some future tall ships crew. They enjoyed the ride. 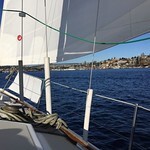 A great day for a sail, even if the winds were a little shifty. 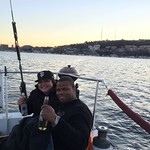 But we had a great time and the new sailors did great. They were tacking and gibing without any direction. Great winds for a lesson, and we sailed under a reefed main and jib. A great way to start off sailing. These two guys have the right idea: learn now so they are ready for the summer. A great day for a lesson! A great day for a sail. There were light winds to start out and it built throughout the lesson. Both of the students did a great job and really picked it up. A fun day on the water started off with just the main sail, and then after about 20 minutes, we put up the head sail and enjoyed cruising around the lake. It was great wind, although a little gusty. We saw several seaplanes but weren’t fast enough to get a good picture of them this time. Most of the guests took a turn driving, and they all did a great job–especially the birthday girl. The track had a couple errors in it but is mostly right. A great day to be on the water. A great lesson, where everyone picked up sailing pretty quickly. We even were able to play with some of the other boats who were racing on the lake. Light winds at the start of the lesson, but it picked up and ended up being a good sail.